Light, we all need it. There are times we don’t have it. Don’t settle for that anymore with products that come from LuminAid. The company was featured on the television show Shark Tank on the ABC Network, and received an investment from Mark Cuban himself. The company makes portable, solar powered, rechargeable light sources that can be used in different situations like Camping, Hiking, Boating, Emergencies, Disasters and more. Imagine having something that is always ready to use, holds a charge, and convenient to have wherever you are. Keep you and your family ready for anything, or use these in the pool, a lake, where ever you are to illuminate the night sky so that you can feel safe, and secure. Check out the full review Tom did over at A Medic’s World here. Tom over at A Medic’s World has these in his emergency kits for home, and the one for his Nissan X-terra for when he goes on road trips, or traveling of any sort. Find out how you can buy your own by visiting Tom’s review over at his site. So what will you do with them when you win? What will you use them for? Will you gift them to someone else who might need them? If you want to get them as a gift, be sure to check out Tom’s review and find out how you can get them. These are so neat! I love when a new product comes out and we are able to offer it as a giveaway to our readers. What a great bundle to check out these great lights! Thanks so much for including my readers here at Tales From A Southern Mom. Open to residents 18 years and older in the US and Canada (void in Quebec). One entry per household except for daily entries like re-tweets. Winner will be selected and will have 24 hours to respond to winning email. Otherwise a new winner will be selected. A Medic’s World, nor participating bloggers were compensated for this post. LuminAid is responsible for prize delivery. I’ve enjoyed watching Shark Tank but did not see the “luminaid” episode. Were I lucky enough to win i would put them in our “power out” emergency kit.. Unfortunately we seem to have a lot of episodes of our lights going out. I have watched the show once or twice, but did not see this episode. This looks great since we lost power twice this year so far in this winter weather! I do watch Shark Tank. I missed the episode in which Luminade was on though. I would take it camping, we are always outside in the summer and it would be perfect in our yard at night. Never saw Shark tank.I would use this camping and home if power out. I like that the light is waterproof and charges in 7 hrs. I do watch Shark Tank with my husband, but I missed the episode for this product. Oh! And I would use these as a part of our emergency kit! Darn, I missed this one, and I usually watched Shark Tank. People can invent the most amazing things. I would use this on our terrace, it would be nice to sit out there with these in summer. UNFORTUNATELY, I DID NOT SEE THE EPISODE. I HAVEN’T WATCHED ANY. SOUNDS INTERESTING AND I MAY JUST TUNE IN! THIS IS A WONDERFUL PRODUCT! I have never seen the show Shark Tank before. I would use it on my patio. I have never seen the show Shark Tank. I would use them at home in case of power failure. 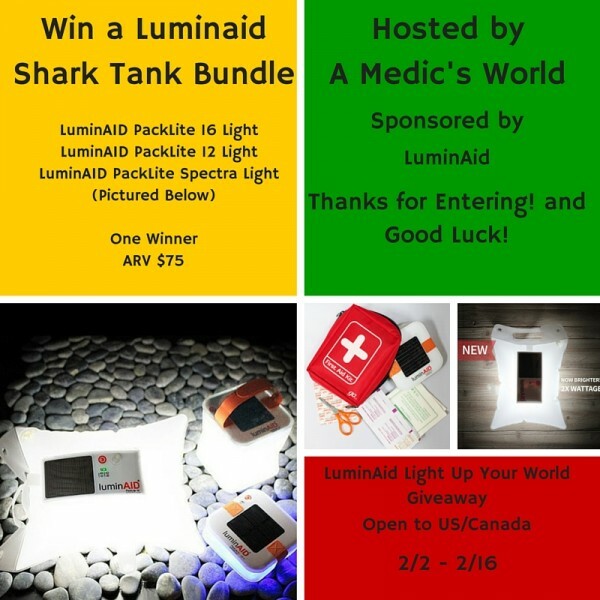 I do occasionally watch the TV Show Shark Tank, however, I did not see the episode with LuminAid. If I won, I think I would probably keep these in the car, just incase we ever have an emergency. No I do not watch Shark Tank. I am lucky I get to watch Tv at all here.. the husband DOES hog the remote so I just leave and go my sewing room and listen to the radio and be busy. I would LOVE this product! We could use them on camping and just all summer.. we have so many nights out in the yard.. the kids would love this. I do watch Shark Tank, but didn’t see the episode this product was featured on. I would use it when I go outside at night and need to see, or when the power goes out. I did not see the show, but would use them outside on our deck. I did not see the episode, but would use them for camping.